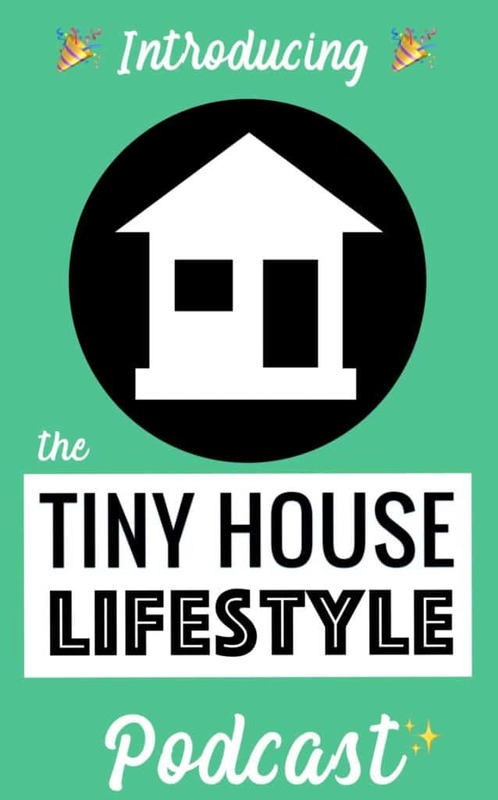 I get a lot of emails from people who have fallen in love with the tiny house way of life, but who, for whatever reason, cannot build and live in a tiny house. Often it's a case of money, but other times it's to do with age and mobility, responsibilities and ties, family and relationships, and so on. It's a shame when someone wants to live in a tiny house but can't either at all or just in the immediate future. But that doesn't mean they have to give up on their dream entirely. There are plenty of ways to get the benefits of tiny house living without actually living in a tiny house. But first of all, it's useful to ask yourself why you're drawn to tiny houses. What is it about this movement that gets you excited? Why do you want to downsize? 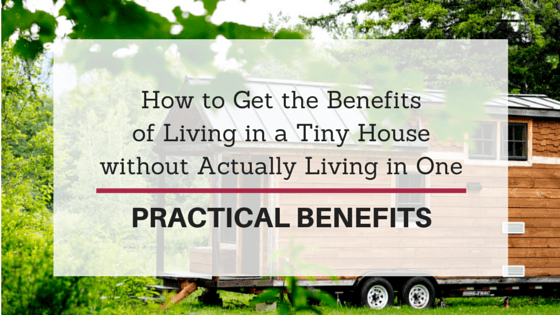 Once you know which benefits of tiny house living are most important to you, you can find alternative ways to get those benefits. 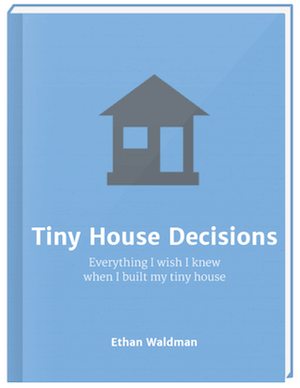 In next week's post, we'll consider the psychological benefits of living in a tiny house. Today, we'll look at the practical benefits. Benefit: Perhaps one of the most obvious side effects of moving into a tiny house is reducing the amount of belongings you own. There simply isn't all that much room in a tiny house, so you're forced to get rid of the clutter and keep only the items that you need or love. For many people, this forced minimalism and simplification is a big part of the appeal. 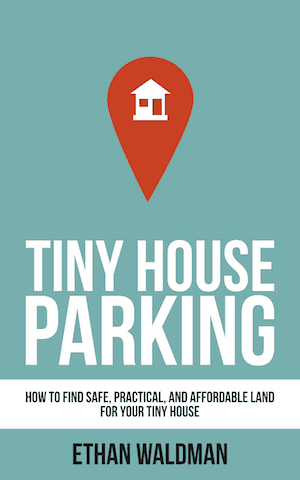 Alternative Source(s): You might not be able to move into a home the size of a parking space, but perhaps you could still downsize. Go from four bedrooms to two or switch your house for a condo. If you currently pay for extra storage, cancel your payments and find a way to cut back. By reducing the size of your home, you'll be forced to get rid of some of your stuff. Alternatively, become a minimalist. There are plenty of minimalist challenges you could try to get started. Why not count the number of things you own and work towards having only 100, 200, or 500 things? If you're a hoarder, try throwing out one item every time you buy something new. Make it into a game. If you want to take it to the extreme, get rid of your home and your belongings, keep only those items that you can fit in a backpack or suitcase, and become a nomad. When you have nowhere to keep your stuff, you find you no longer need it. Benefit: My only real expenses are my utility bills, which are tiny compared to what they were before I moved into my tiny house. For example, my energy bill is $30 a month for propane at the absolute highest, when it’s freezing here in Vermont. When your home is small, it doesn't take as much to run it, so your bills are low. Alternative Source(s): Reducing your utilities is all about reducing consumption and increasing efficiency. Improve your home's insulation. Switch to energy-saving lightbulbs or LEDs. Use a thermostat to control the heating. Unplug electronics when you're not using them. Wear layers. Get out of the house during the daytime. Shower at gym or at work. If reducing your living costs is one of your main reasons for wanting to go tiny, reduce your energy, water, and electricity consumption in your current home first. Benefit: If you have access to your own land, once you've built or bought your tiny house, you could actually live in it for free. Alternatively, you might have a generous friend or family member who would let you park your tiny house for free. Otherwise, you're looking at paying just a few hundred dollars per month in rent because all you need is a tiny patch of land and some hookups. Alternative Source(s): If cutting your rent is your biggest motivation, there are several ways you could do this without moving into a tiny house. You could move in with someone else, whether that's your parents or strangers in a house share. You could move to a cheaper area or downsize. To get slightly more creative, perhaps you could trade your skills for rent or in exchange for a discount on your rent, perhaps by mowing the grass and doing odd jobs around the property, or even by tutoring your landlord's child. If you're really flexible, you could become a caretaker and keep an eye on a building in exchange for living there. Or you could become a live-in au pair, nanny, or cleaner. There are lots of options. It's just a case of thinking outside the box. Benefit: Tiny houses take less time to clean than regular houses, simply because there's not as much space to get dirty and not as much ground to cover. Moving into a tiny house could save you a few hours a week in jobs. Alternative Source(s): This one's easy. If you have the money, hire a cleaner to give your home the once over every week or so. If you can't afford a cleaner, clean up as you go. Every time you use a dish, wash it up. Every time you get something out, put it away again. Alternatively, just have less stuff! Benefit: Tiny houses have less of an impact on the environment because they require less energy to heat and so on. It's simply not possible to use up all that many natural resources in a house of this size. Alternative Source(s): To start with, you could try to reduce your utility consumption (see above). You could also install solar panels or look into greener sources of energy. Make energy saving a priority when you buy new appliances such as air conditioning units and refrigerators. Go for the most efficient options to reduce your impact on the environment. Of course, there are plenty of other ways to reduce the effect you have on the environment that don't involve your home. You could sell your car and walk or take public transport instead, you could recycle more, and so on. Benefit: For many people, the appeal of going tiny is the idea of living off-grid and being less dependent on the rest of the world. Alternative Source(s): While it's probably not going to be possible to be completely independent living in a condo or regular house, there are plenty of ways to become more independent. For starters, you could produce your own food, by growing vegetables and keeping chickens or other animals. You could limit the amount of technology you use, thereby using less electricity. You could use a composting toilet and collect rainwater to limit your dependency on the local water supply and sewage systems. Benefit: Although tiny houses are pretty heavy and many are not built to be moved frequently, some people build their tiny houses with the intention of traveling in them. You often see photos of traveling tiny houses online, and traveling with your home is a nice idea. Alternative Source(s): If you definitely want to travel while taking your home with you, you could buy an RV or perhaps do a cycle tour with a tent. If neither of those options is feasible or appealing, you could see the world through other media: books, language classes, documentaries, language exchanges, and meetings with expats in your area. Ask yourself why you want to travel and find another way to achieve the same outcomes. Benefit: Part of the appeal of tiny houses for lots of young people is the idea that they can own a home but not be tied to a particular area. This was certainly the case for me. When you own a tiny house, you can quickly and easily move to another part of the country and take your home with you. All you need is a new place to park it. Alternative Source(s): The obvious solution here is to rent rather than to buy your home. If you can, get a short-term lease, or at least one with a short notice period, so that you can leave quickly, should you need or want to. Otherwise, if you really want to be footloose and fancy free, forgo the permanent home altogether and try Couchsurfing. Benefit: When you don't have much space to work with, you're forced to be clever with your belongings and furniture. Tiny houses, RVs, and other mobile homes use clever space-saving items, such as folding tables and couches that contain storage space. Alternative Source(s): If you want to use the space you have more efficiently, do some research about the types of furniture and space-saving devices used in tiny houses. The chances are that most of them will be available to buy somewhere. You could simply install them in your regular home. If, however, your problem is more that your belongings tend to expand to fill the room you have available, you might need to use a more drastic approach. Downsize or rent out part of your home to make less space for yourself. 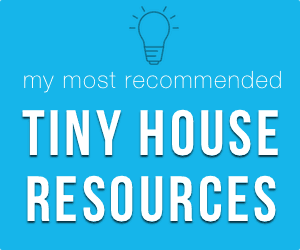 Lots of Alternatives to Tiny House Living! If you can't go tiny for whatever reason, ask yourself why you want to live in a tiny house. Try to get those same benefits elsewhere. Often all it takes is a little imagination. Of course, you could get most of the benefits of tiny house living without moving into a tiny house, simply by moving into an alternative to a tiny house. Many of these small types of homes come with the same benefits as tiny houses, but they might be better suited to your needs.